Local anesthesia is used to numb the area. You will lie flat on a table. A small cut will be made beneath the collarbone. The pacemaker is placed through the cut. The wires (called leads) will be threaded through a vein from the collarbone to the heart. Lastly, the cut will be stitched closed. The anesthesia will prevent pain during the procedure. Medicines will help with pain afterward. 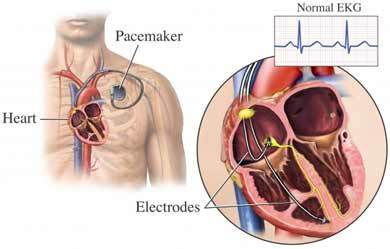 The pacemaker will be programmed to fit your pacing needs. Once everything is working properly and you have no problems, you can go home. Avoid strenuous activity, especially involving the upper body, for 4-6 weeks. Avoid excessive movement of the arm and shoulder on the side of the pacemaker for 2 weeks. This will help you to avoid dislodging the leads. You may be given a sling to wear to help remind you. A hard ridge may form on the skin along the cut. This usually recedes as the wound heals. Pacemaker. American Heart Association website. Available at: http://www.heart.org/HEARTORG/Conditions/Arrhythmia/PreventionTreatmentofArrhythmia/Pacemaker%5FUCM%5F448480%5FArticle.jsp#.W0O4YtVKhQI. Updated December 21, 2016. Accessed July 9, 2018. Pacemaker insertion. Johns Hopkins Medicine website. Available at: https://www.hopkinsmedicine.org/healthlibrary/test%5Fprocedures/cardiovascular/pacemaker%5Finsertion%5F92,p07980. Accessed July 9, 2018. Pacemakers. EBSCO DynaMed Plus website. Available at: http://www.dynamed.com/topics/dmp~AN~T906162/Pacemakers . Updated January 11, 2018. Accessed July 9, 2018.